Mr Green is a multi-award winning casino that has carved out a distinctive brand and approach for itself from a base in Malta. This was one of the first big casinos to go online-only, and has games and slots from all of the big software houses – as well as many innovative smaller ones. The announcement that this brand would also open a sportsbook, and that it would also be distinctive was made earlier in the year. This week the new book opened its doors, just in time for Euro 2016! According to Per Norman, the Chief Executive of the company behind Mr Green, this is a natural growth of their brand. The cross over between casino and sports betting is huge, and this new product will enable bettors to do both in the same place using the same account. I saw that there are already some casino promotions targeting football fans, with €10,000 up for grabs at half time during the opening match – and I am sure many similar deals to follow. I checked out the new book and have to say that my first impression is very positive. This is now an option from the top level menu, right next to casino. You are then taken to a page with a distinctive header and tiles which cover the current live matches. 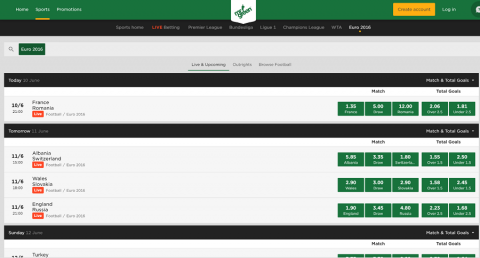 Across the menu for the sports betting area are the popular leagues (English Premier, Champions League, Bundesliga, Euro 2016) and other popular / current sports. At the moment the only non football bets were on tennis – though I am sure this changes. With Mr Green not open to the US, the focus on European / Worldwide sports rather than the US ones was clear. I am not sure if there will be opportunities for non-US players to bet on the NHL, NFL and so on next season or not. When you do select the sports, the tiles are used again. This looks very clear and clean compared to other betting platforms. I do wonder how it will cope with a busy Saturday afternoon when the major leagues start again. Some way of narrowing the bets / offers is sure to be needed. Thinking of offers – the tile system means that these can easily be placed into the ‘flow’ of matches without disrupting things too much. I recommend you take a look at the Euro 2016 bets and see the offers there (there is rarely a better chance of taking advantage of great deals than when a sportsbook is brand new after all). Mr Green famously tailors bonuses and specials based on your history and sends them in a weekly mail. I’m looking forward to what they come up with on the sports betting side! Check out the introductory / Euro 2016 offers at www.mrgreen.com for yourself now! To keep up to date with the latest sportsbook bonus offers, check out this article!